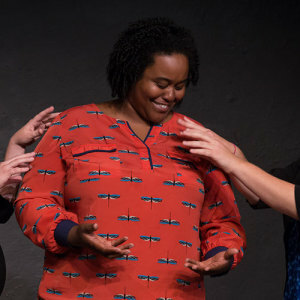 Eva Lewis has been in love with improv since she took her first class at Second City in 2009. Her love of improv and family led her to move to DC where she completed the WIT curriculum. Eva is currently a member of independent troupes Press Play, Sister Act, and Getting to 3rd Base. She is a former member of the independent troupe Neighbors and the WIT Harold team People Like Us. She would like to give a shout to her parentals, sisters, niecy pooh, all the Lewis pets alive and dead, the great Maryland Governor Martin O’Malley and, last but certainly not least, God! Eva is currently a member of independent troupe Press Play, WIT Ensemble King Bee and WIT Special Project October Issue. She is a former member of the independent troupe Neighbors, Sister Act, Getting to 3rd Base and the WIT Harold team People Like Us. Eva has completed improv study at Second City Chicago, iO Chicago and WIT. Improv is Life! She would like to give a shout to her parentals, sisters, niecey pooh, all the Lewis pets alive and dead, and, last but certainly not least, God!